Houdini died on Halloween. He expired on October 31, 1926 at Grace Hospital in Detroit. The official cause of death was peritonitis, internal poisoning resulting from a ruptured appendix. 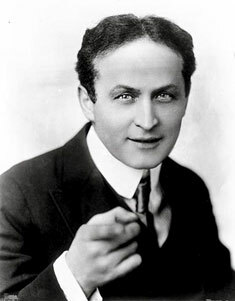 At the time of his death, Houdini was planning an endurance stunt that would require him to survive entombment in a coffin. 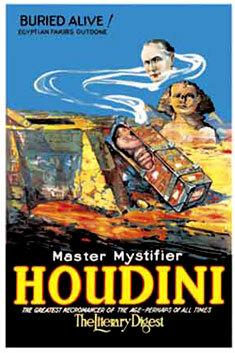 To drum up excitement for the upcoming stunt called "Buried Alive", Houdini was exhibiting the coffin in the lobby of his theater shows in the fall of 1926. Ironically, that coffin was used to transport his body back to New York City for burial. It seems quite appropriate that the world's most famous magician should pass away on the year's most "magical" day. Even more intriguing, Houdini was 52 years old when he died, the exact number of playing cards in a deck. Further, he was born 26 years before the start of the new century, and died 26 years into the next one- as if his "life's deck" had been deftly cut in half by Fate, the ultimate magician. For a full ten years after Houdini's death, his wife Bess conducted a séance on October 31. These séances were always attended by the top names in magic, as well as personal friends of the great magician. Houdini had told Bess that if it were possible, he would send a message to her "from beyond", in secret code. Though Bess herself stopped participating in the séances after 1937, members of the magic fraternity have kept the tradition. Each Halloween, there are numerous Houdini séances held in various locations around the world.